If you've received an invite in the mail covered with pastel-colored farm animals, a baby shower is likely in your future. If you're heading to one anytime soon, you're probably wondering what to wear. There are no hard rules like there are for weddings, where white is off-limits, but it can still be tricky to find the perfect dress. For a little guidance, we enlisted the help of cool fashion girls who filled us in on the styles they always wear. 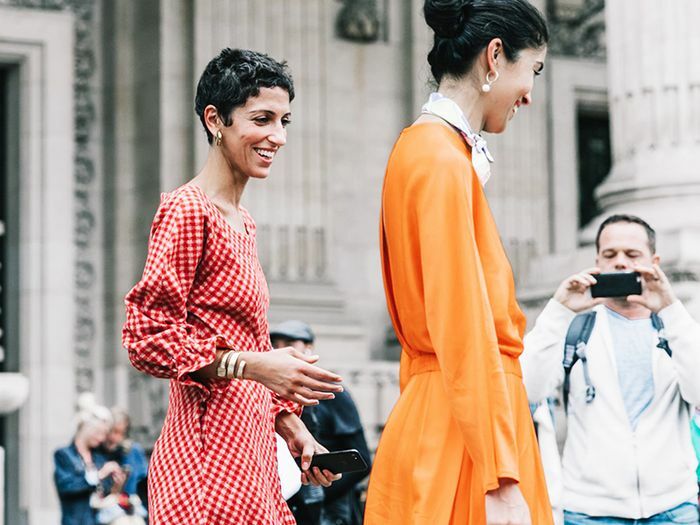 Everything from striped shirtdresses to floral off-the-shoulder silhouettes made the cut—and even jumpsuits for the dress averse. Whether you're headed to a festive garden party or a brunch, you're sure to find some outfit inspiration. Keep reading to find out what fashion girls wear to baby showers, and then shop our favorite styles. Go on to shop our favorite dresses for a baby shower. We're loving polka dots right now. Style these with a kitten heel. In a dainty floral print. Pair this with white ankle boots. Try out a wrap dress. We love the ruffled strap. Finished with a ruffled hem. Florals are perfect for a baby shower. This post was originally published at an earlier date and has since been updated. Next, read about the date-night outfits stylish women swear by.